When you enter the A.N. Bush Gallery located in the Bush Barn Art Center in Salem, Oregon, you expect to see unusual and beautiful artwork. You are not necessarily expecting to find a display of quilts...especially beautifully designed, colorfully creative quilts that have been pieced in the innovative style now known as liberated, intuitive, or improvisational quilting. But when you walk up the charming little steps of the art gallery to the stair landing.... and you see the first welcoming quilt by Kay Worthington and the words Bits & Pieces: Intuitive Quilts from the Northwest and Beyond .... you realize quilts are now firmly planted in the world of art, and art galleries. Bits & Pieces features the work of both established, and emerging fiber artists living and working in the Pacific Northwest. The exhibit was the brain child of artist/ organizers, Bonnie Hull and Kate Speckman, made pos­si­ble through the gen­er­ous sup­port of Michele Pat­ter­son, Pres­i­dent of the Salem Art Asso­ci­a­tion Endow­ment Foun­da­tion. This new multi-layered world of quilts as art may have begun with the ladies of Gee's Bend, but has evolved into an entire movement of quilters, both online and...off the grid. And while some of the beautiful quilts of Gee's Bend were invited into this exhibit and that information went into publication, unfortunately, their arrangements fell through. However, I was not disappointed in the slightest...for the quilts I did see were unique, and lovely in their own right. 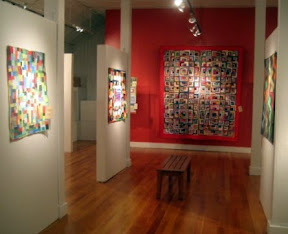 At the core of the exhibition are the works of five invited quilters: Jean Wells, of Sisters; Andrea Balosky, formerly of Sisters and now living in Nepal; Dorothy LeBoeuf and Salem native LeeAnn (Erickson) Decker, both of Seattle; and Sujata Shah, of Philadelphia, who began quilting while living in Seattle. The exhibit also includes work by a number of juried quilters from around the Pacific Northwest. And the extra bonus of local quilters and artists, exhibition organizers, Bonnie Hull and Kate Speckman and artist/quilter Kay Worthington, whose quilt is shown above on the titled red wall. Jean Wells - Quilt Artist, Author, and Instructor known for her quilts, as well as for her ownership of the Stitchin' Post in Sisters, Oregon and the nationally known Sisters Outdoor Quilt Show, has long been an artist in progress. Her quilts in this show are a combination of several I have seen before, and two new ones that I had yet to see...proving she continues to surprise and delight us with her incorporation of the natural world into her fiber art and the constant creation of new and even more unusual quilts. Andrea Balosky, is a quilter who many of us also know as Nyima Lhamo. Originally from Oregon and having quilted in both Portland and Sisters, she has become an inspiring story of determination to create with few resources and an indomitable spirit. Nyima(Andrea) has found a way to create quilts and transport them out of the Himalayan Mountains from the small village of Mungpoo. Originally, she had only a common pair of utility scissors, fabric given to her from another Indian quilter, and batting she had originally taken from upholstered pieces. I first learned of Andrea when she emailed the Alzheimer’s Art Quilt Initiative earlier this year, asking AAQI founder, Ami Simms if 'she could bend the rules a bit." Nyima (Andrea) wanted to register six quilts for donation to AAQI, but couldn’t print off the confirming email because she has no printer in the Himalayan Mountains! Andrea is an American who has lived lived in the Himalayas since 2004.. She describes herself as a “Buddhist recluse, but recently with internet access." When she moved to Mungpoo in the Darjeeling District of West Bengal, India, she transformed from her previous life as a professional quilter in Oregon to .."engage in a contemplative life, I easily renounced all of my mundane activity, including quilting." Life and quilting have now combined. Her quilts (shown above) are exceptionally lovely and intuitively original. To learn more about Andrea read the full story here. Many of us know Sujata Shah as the previous Seattlite who moved to Philadephelpia. A member of the Pacific Northwest quilters known as 'The Rebels" which also includes exhibition quilter Leanne Decker and exhibit creator, Bonnie Hull, each quilter maintains her own online blog. (click on their names for hyperlinks) So, it was lovely to be able to see some of their beautiful quilts, as well. ***And additional quilts from artists from the Salem and Portland areas that had their quilts juried into the exhibition. They included Lora Bristow, Victoria Gordon, Joanna Price, Jessica Rodgers, and Ross Sutherland. Double click to zoom into my online photo album and use the magnifying icon for more detailed viewing of any of these quilts for each quilt has a story to tell, and each artist a way of expressing it. As for me, I just absorbed the entire experience and hoped I would remember what I could, and have photos of the rest! (Bits&Pieces is part of Salem's "Quiltopia". a series of events that take place over the entire weekend. Photos from that quilt show at Mission Mill coming next! Join in the fun by signing in on the Friend Connect window for updates on quilting, crafting,and links to thousands and thousands of free patterns and tutorials offered from a variety of online sources. Oh wow, what a great show! Gorgeous! These are so beautiful and how cool to see quilts in an art gallery! Wonderful post. Thanks for sharing this. These are all gorgeous, thanks as always for such great posts! Thanks for your kind words! These quilts look amazing in your gallery. I am glad you posted all the pictures for those of us who could not go and see them in person! I feel quite honored to be invited! Great post, Michele! I couldn't make it, but an to before it ends. Thanks for the background details, too. Beautiful inspiring work. Oh Michele, you began my week with wonder st the amazing work of these quilters. Thanks so much for taking the time to do this. I really like to new look of the blog as well. Hope your day is a sweet and peaceful one. It looks like a beautiful show. I am so glad you got to see it, and that you are so generous that you took us along with you. Thank you so much for the show of such beautiful quilts! wow! fabulous blog post of wonderful quilts. just wish i could see it in person too! Wonderful quilts! What a great show! Thanks Michele for the virtual tour!!!! What a fabulous array of quilts! Some beautiful quilts there - thanks for sharing. wow, lucky you to see these in person. thanks for sharing them. Michele, ma belle ... tres bien ensemble! Like most of your viewers, I would love to have seen them in person. Fortunately for us, we are touched by your enthusiasm and your thoughtful commentary. My apologies for the untimeliness of this comment. Itʻs puja month. Kids are home from school — server clogged, thus unavailable. So, I may be tardy but my wishes for you are hearty! Thanks for all that you do for Quilt World and AAQI. fabulous photos and thoughtful words to go with the quilts..a very special "art" exhibit indeed!